Have you considered owning a franchise in the St Louis, MO area? 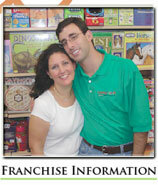 Award Winning Learning Express Toys - the Nations Largest Toy Store Franchise Continues Expansion across the US. With all of the economic doom and gloom news it’s refreshing when you find businesses that continue to grow and prosper. As unemployment rates escalate, many are left pondering their next step professionally; either updating and sending out resume’s to find a new job working for a business while others look into pursuing their dream of opening their own business. Learning Express Toys, winner of the 2009 Franchise Business Review Specialty Retail Category, has plans to continue its growth in 2009 and is seeking to establish franchises in St Louis and throughout Missouri. This year they are on track to open at least 17 new locations throughout the United States. “Our stores are truly neighborhood toy stores. Our businesses are growing and our success has been a community effort, “said Sharon DiMinico, founder and CEO of Learning Express Toys. According to DiMinico, unlike several big box retailers that have fallen victim to economic pressures and have been forced to close their doors, Learning Express toy store franchises continue to serve children in communities across the nation. The company reports that 21 new locations were opened in 2008 and currently, the franchise has 140 locally owned and operated stores nation wide. “Our store owners are highly-motivated individuals who are passionate about owning their own business and creating lasting memories for their customers, as well as becoming an integral part of the community in which they serve,” said DiMinico. Built on a concept that learning should be fun, Learning Express toy stores pride themselves on the quality and uniqueness of their toy selections. The stores offer a full line of children's toys including developmental toys for infant, toddler and preschool age kids, as well as arts and craft kits, construction sets, and other items that are exclusive to Learning Express and specialty toy retailers. Visit the Learning Express franchise opportunities web site for more information. Learning Express is a family of 140 independently owned and operated toy store owners - all operating under the name Learning Express. Learning Express stores provide an extraordinary shopping experience with knowledgeable sales staff offering expert advice on choosing the perfect toy, for every child, for any occasion. The product mix is carefully selected from manufacturers around the world and has exceptional play value. A Birthday gift registry, free gift-wrapping, free personalization, civic fundraising, and consumer VIP programs make every Learning Express store an integral part of the community.